Price FP-867 is £3.95, while FP 871 and FP 873 are £3.45. 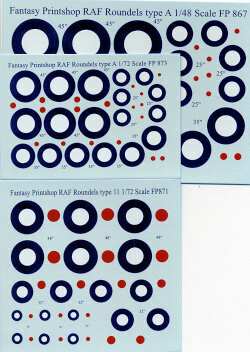 With that in mind, Fantasy Printshop in the UK has produced a full series of RAF roundels. The number of different versions really is rather complex, though most of us probably don't realize it. So, I've decided to review these in groups based on similar designs. For instance, this set is somewhat standard red/white/blue roundels. The top two sets are FP 867 and 873 in 1/48 and 1/72 respectively. These are Type A roundels. A very similar type 11 roundel is shown below and is available in both 1/72 scale as set FP 871 and 1/48 as set FP 865. Printing is superb with very small carriers and separate center dots to assure proper registration.